You are here: Home / Healing / What is Orgonite? A perfectly preserved state of projective and receptive energy, orgonite is a metaphysical tool made of a petrochemical resin, organic materials, crystals and metal shavings. Orgonite works continuously to clear its surroundings of negativity and harmful environmental elements. Beautifully organized and fixed in a permanent state of being, the contents are meant to both attract and repel orgone energy, creating a cleansing affect. Orgone energy is bio-energy; our internal energy as well as the energy in our surrounding environment, also referred to as “Chi” or “Prana”. Orgone is said to sustain the projective and receptive energies of the organic and non-organic materials in a state of constant excitement. Each orgonite contains a quartz crystal, which gives off a charge when pressure is applied to it. Metal scrapings will repel or project the orgone or Chi while the organic resin and other organic materials attract or receive the orgone. The resin shrinks when it cools and therefore constantly applies pressure to it’s contents. All this results in the permeation of a charge which helps to cleanse and balance stagnant and negative energies and bring them to a balanced state. Orgonite pyramids, like crystals and colors, can be used for various specific intentions based on the type of materials included in each one. For example, a rose quartz orgonite will help bring about feelings of harmony, compassion, respect and forgiveness while increasing your ability to love yourself and engage in meaningful loving relationships. This rose quartz orgonite wand is made with metal flakes, resin, and rose quartz crystals. Kheops, Intl., offers a collection of orgonite products including orgonite pyramids, such as the 7 chakras pyramid with seven different layers of crystals to correspond with and cleanse each of the seven chakras. 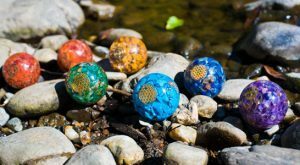 The Orgonite Collection also includes many beautifully crafted and uniquely individual pendulums, pendants, massage wands, spheres and jewelry. Enhance your creativity and imagination while clearing your space of negativity and harmful environmental elements with our Green Aventurine Orgone sphere. Our Amethyst infused Orgone Massage Wand fits nicely in your hand and has a rounded end for spreading energy and a pointed one for directing it. Amethyst helps to balance the crown chakra, is used in healing and to strengthen awareness. We offer an orgone pyramid for each of the seven chakras, such as the carnelian orgone pyramid for the sacral chakra. Orgonite has many applications depending on the types of materials used and makes a wonderful addition to any room, office, spa or workspace. By harnessing and projecting vital life force energy, you can feel the positive effects of the many beautiful orgonite products Kheops, Intl., is pleased to offer. NEWEST EMPLOYEE FOUND THIS BLOG VERY HELPFUL TO UNDERSTAND ORGONITE AND THE PROCESS WITHIN IT. CHANGING TEMPERATURES PUTS PRESSURE ON THE CONTENTS, INCLUDING THE RESIN, WHICH HELPS MOVE CHI/PLANA THROUGH THE ORGONITE, AND THE OTHER PARTS IN THE ORGONITE HELP TO ABSORB/TRANSFORM NEGATIVE CHI/PLANA TO MORE POSITIVE. It is very interesting how orgonite works and so glad you found this blog useful. A constant “scrubbing” action of projective and receptive energies causes this bio-organic material to work. Hope you enjoy yours!